Egypt continued their positive start to World Cup qualifying with a comfortable 2-0 win at home to Ghana in Alexandria on Sunday. Hector Cuper used the same strategy he employed against Congo: stay compact and take advantage of the opposition’s disorganisation when they have lost possession. The Pharaohs were resolute, clinical and a little lucky, which is exactly what you’d want when coming up against a team with more quality. Ghana, on the other hand, threw bodies forward in possession but had no plan as to how they would break Egypt down. You’d think they had never watched their opponents play before. This was confounded by bizarre player selection choices by Avram Grant. Emmanuel Agyemang-Badu, a defensive midfielder, played on the right wing and offered no attacking threat. Christian Atsu played on the left which took away a key goal-scoring threat. It took 70 minutes for Grant to rectify this, and he did it by taking off Ghana’s best player on the night, Thomas Partey. This has become a familiar story during Grant’s reign as manager. 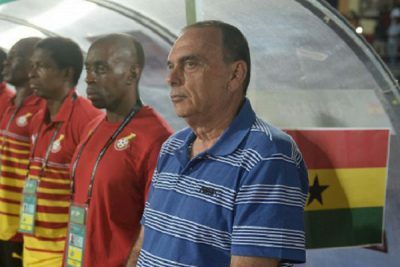 The Israeli actually has a good record in charge of the Black Stars – he’s only lost three matches in 22 games. But if we’re honest with ourselves, when playing against teams like Comoros and Mauritius, you’d almost have to conspire against yourself to lose those kinds of fixtures. It takes minimal competence to achieve the results Grant has. With all this in mind, it’s remarkable he was hired in the first place and speaks to general mismanagement by the Ghana Football Association. When you hear that a man with a personality as dry as desiccated coconut “charmed” bosses during his interview, alarm bells should be ringing. What has gone under the radar is that Grant made numerous promises in relation to developing Ghanaian football. This exposes a fundamental misunderstanding of football development on the GFA’s part. Firstly, Grant has no history of planning and implementing football structures. Secondly, what is the actual technical director, Oti Akenteng, paid to do? International management is short term by nature, so hiring someone based on flimsy development credentials is silly. The GFA are ultimately to blame for the Black Stars plateauing since the 2010 World Cup. They have hired average coaches since then, culminating in the employment of a very expensive charlatan.